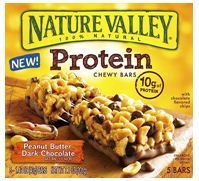 Print a $1.10/1 Nature Valley Protein Bars coupon. Love these! Good nutrition and they taste good! Thanks! Sure thing. Got some of the Dark Chocolate Peanut Butter ones last week here in Southern PA at Giant Food Store. Regular price is $3.15, but I got them on sale for $2.69 minus a $.5o coupon (doubled). Plus they were part of a special if you purchased a certain number of select mix/match products, got gas points. 😉 P.S. They don’t taste too bad either! Absolutely fabulous! And with 10g protein– way to go.